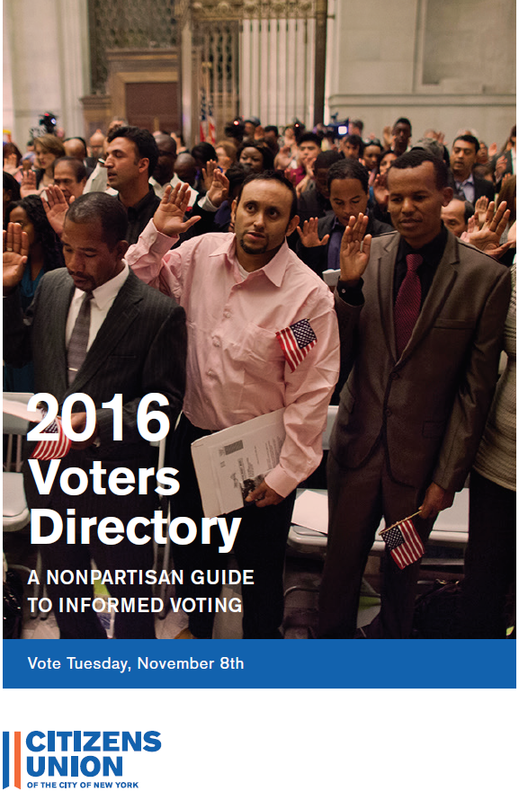 Welcome to the Citizens Union 2016 General Election Voters Directory online! This Tuesday, November 8th, New Yorkers will vote in the general election to select candidates running for federal and state office. An overview of the 2016 elections, including voting and registration information and listings of every contest for all races that will be on the ballot in New York City on November 8th, 2016. A roster of Citizens Union’s endorsed candidates for the state legislature in several key districts, and information about the rigorous evaluation process and assessments of candidates. A report on candidates running unopposed for seats in the NYS Legislature. 38 Volunteer LCC members, 4 interns, and 6 staff members formed nonpartisan interview teams and evaluated 13 candidates in 7 races for State Senate and Assembly races. We also secured the answers to our questionnaire from many more candidates. We thank them for contributing their time, energy, expertise and commitment this summer to interviewing and evaluating candidates. Mail your Absentee Ballot Application or Letter of Application by Tuesday, November 1st. Apply for an Absentee Ballot in Person at your local county board of elections office by Monday, November 7th. Mail in your Absentee Ballot with a postmark by Monday, November 7th – it also must be received by the local board of elections no later than November 21st. Drop off your Absentee Ballot by Tuesday, November 8th to your local board of elections office – a friend or relative can drop it off.